As most of you will know, Soumya recently reviewed my book here on her blog. I secretly lurked around in the comments section, and was pleased to realize that many of her readers were interested in mythology in general and the Mahabharat in particular. So I asked her if she would like me to do a guest post, and once again to my pleasant surprise, she said yes. So here I am. In a nutshell, the Hastinapur series (of which Winds is the first book) aims to tell the story of the Mahabharat from the viewpoints of all the prominent women characters. This doesn't mean just Kunti or Draupadi, but also those women whose voices we rarely hear in popular retellings and movies. For example, in Winds, the tale is told by Ganga and Satyavai, two incredibly strong women (albeit in different ways) who occupy little more than a paragraph each in the canon. Her tale is a long and tortuous one, but in the end it is she who had a bigger say in the fortune – and fall – of Hastinapur. Fortune because she brought about the great marriage alliance of the age which merged Kuru and Panchala, the two great kingdoms, into one. Fall because the son she sired would grow up to be the warrior who killed Devavrata, my son, the undefeatable champion of the throne of Hastinapur. I used to hear it being said that no warrior in North Country could drive a chariot as swiftly as Devavrata. No one could fight with a sword as skilfully as he. No one could shoot arrows as rapidly as he. He read the scriptures and understood them; he debated with Brahmins and was hailed as their equal. In politics and battle strategy he had no peer. It warmed my heart to hear such things, yes; but I was also wary. I was wary that Devavrata’s destruction would come about from that one place men scarcely care to look: from within him. He would be destroyed – as all powerful men eventually are – by the consequences of their actions, by the ache they cause people around them by their choices. Amba’s tale, then, is also the first chapter in the tale of Devavrata’s ruin. In some versions of the story, Amba undergoes a gender change and becomes Shikhandi herself. But since in my novel I am trying wherever I can to stick with realistic life spans, it made more sense to assume that Shikhandi is the son of Amba. This opened up possibilities, because if Amba had a child who has a claim to the throne of Panchala, then she must have been, at some point, Drupada's mate. The other man in her life is Parashurama, the sage who takes her under his wing when the world shuts down on her. How the three men shape Amba's life forms the crux of book one. Little is known of Kunti's childhood. She enters the Mahabharat as a prominent character only after her wedding with Pandu. Of her youth, though, one incident is often talked about: her giving birth to the son of Surya, and then abandoning him. But Kunti must have had a life before she met Durvasa (who would give her the boon to summon the gods), and indeed, she was born into the house of Shurasena as a sister of Vasudev, the biological father of a cowherd who would grow up to be Krishna. Once again, there are possibilities here. When Kamsa imprisoned Vasudev and Devaki, did Kunti not feel duty bound to rescue them? She must have, though the epic is silent on the matter. Did she have a hand in Vasudev escaping from Kamsa's prison to rescue his son? Maybe, maybe not. Her childhood and early youth must have been spent in a highly politically charged atmosphere between Shurasena, the kingdom of Kunti, and Mathura, that lay across the Yamuna, ruled by Kamsa. With a little bit of imagination, one can think up an interesting story for the princess, a story of adventure, love and loss. I do not remember much about the day on which I first met Sage Durvasa, much like I do not remember the first time I must have gazed upon the face of my mother. But I remember certain flashes, of sight and smell and sound. As I think back now, I see a flash of brown, almost orange fabric that the sage wore. My nose seems to know the faint, sweet taint of wet sandal paste, and my ears still prick up at the gruff voice of a grown drunkard on the face of an innocent babe. [...]I do not know where I got the courage to say such things to a man I had only met once, and perhaps I was no more than a lovelorn girl in pigtails. But there was something about the glow in Sage Durvasa’s face – whose mystery would be revealed to me later, when it was too late – which seemed to feed my soul and spirit, and I could think of nothing but to breach Mathura’s walls, break open the prison that held Devaki and Vasudev if need be, and bring them back safely to Shurasena. 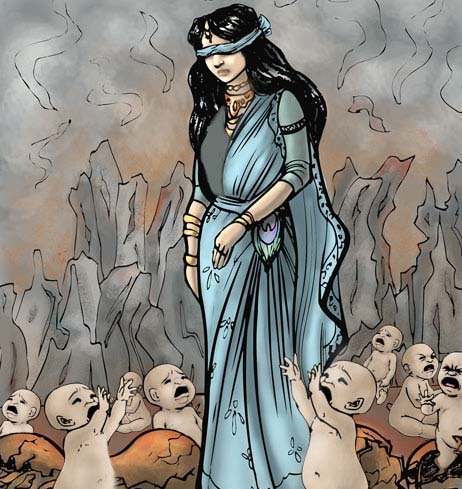 Perhaps the most under-represented female character in the story is that of Gandhari. She brims over with potential in a storyteller's eyes, whether it is her life in Gandhar before she got married to Dhritarashtra, her choice to go blind herself, or her role in the events that followed between the Kauravas and the Pandavas, here is a woman who could have been a strong, memorable character if only Vyasa thought otherwise. But he didn't, which means people like me can. In Pritha’s tale, by the time of Durvasa’s visit to Shurasena and Mathura, Dhritarashtra was already married. Hastinapur had already taken her spot atop the pyramid of Great Kingdoms in North Country. But it was not always so. There exists a rocky land to the far northeast, beyond the lands of Madra and Kamboja, which first settled on the bank of river Sindhu but later migrated inward. They call this kingdom Gandhar, the city of gold. [...]At that moment we come to know that it was all but futile, and we forgive. We forgive all. On her deathbed I found Gandhari smiling and tearful, and her eyes told me that she had made her peace with the world, that she had come to see both those she vanquished and those who vanquished her with the same eye. But she was not always thus. I remember the time when she sat on the throne of Gandhar and ruled with great hope and wisdom. I remember her and her brother, who were just children but fought with more valour than the bravest of warriors for the good of their land. I must beckon the reader eastward now, and a few moons back in time, so that he can peer through my eyes into the royal castle of Gandhar. Who are some of your favourite characters in the Mahabharat? Whose stories would you like to know in more detail? Tell us in the comments section below. On his blog, Sharath Komarraju has written much more on the topic. Head over there and participate! Thanks for leaving a comment. I sure hope that you enjoy the book when it comes out and if you happen to read it. Interesting that you mention Karna as your favourite character. A few days back I asked the same question on my blog and the majority came back with 'Karna.' So I did a follow-up post called 'Discover the five faces of Karna'. You may find it an interesting read. There are very few books which does justice to their female counterparts in mythology. Hats off to you for writing for them. Waiting to read the book. Congrats, Sharath! This does seem interesting! My favorite Mahabharata character was Karna for sure.